I love this stamp set! There are two flower-wrapped greetings (the other one says "Hello") in the set. Yellow roses are my favourite! 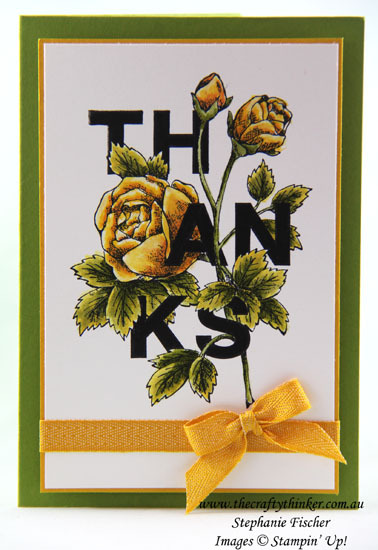 Floral Statements - I love a stamp set that does most of the work! Get different looks by stamping on different cardstock, colour them as you will (or even leave them uncoloured if you choose) and you have a beautiful card! In this instance, I stamped onto Whisper White cardstock with Basic Black ink and watercoloured with Daffodil Delight, Peekaboo Peach, Pear Pizzazz and Old Olive. I layered my panel onto a piece of Crushed Curry cardstock and added some Crushed Curry ribbon before layering onto my Old Olive card.